Natural Gas is the "Buy of the Decade" and the best investment theme for the next 5-10 years. The fundamentals have improved tremendously, and investors are only starting to pile in. 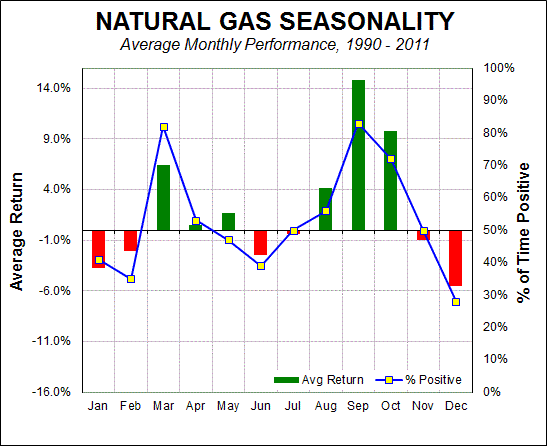 Natural Gas is selling at a discount, entering best seasonal performance period of past 25 years. I present 5 strategies for investing and profiting from this trend. If you're looking to invest in one of the biggest trends of the next 5-10 years that could double or triple in value, with vastly improving fundamentals, smart money and billionaire investor support, now entering its best seasonal performance period, and is selling at a discount --- NATURAL GAS is where you want to be. After a multi-year bear market, which saw natural gas (NYSEARCA:UNG) prices drop from nearly $15 in 2007 to under $2 in 2012 (over 80% decline), we think natural gas has entered a multi-year BULL market. Prices appear to have bottomed in 2012, and even soared more than 200% to an early-2014 high of around $6.50. We think this is just the beginning, and that the strongest momentum and investor participation is still ahead. The severe drop in natural gas prices was largely due to new technologies and methods of extracting natural gas, called "Fracturing" or "Fracking". This new method created huge supply of natural gas which now had to be factored into the price (much more supply = lower prices). However, investors greatly overestimated the supply impact and pushed down the price even further than necessary (investors overreacting as usual). Now that all the bad news is essentially priced-in, any decent or good news is very positive for natural gas. What kinds of improvements are we seeing? With such low prices for natural gas, factories have switched over from coal to the much cleaner nat gas; fleets of trucks are now running on nat gas; auto companies are manufacturing more nat gas cars; pipelines are infrastructure are being built; and many more uses are being developed and implemented. The supply overhang is behind us. Yet with nearly everyone pointing to the excess supply as a major reason why nat gas prices couldn't rise, who would've thought we would be at a supply deficit this quickly? Inventories are now far below 5-year averages. The exportation of Liquified Natural Gas (LNG) to places all over the world will likely drive North American natural gas prices much higher. Natural gas prices vary wildly across the globe. Prices currently stand at only $3.75 in the US, but are closer to $10 in Europe and $17 in Japan. The nature of the market does not allow for such huge disparities to last without arbitragers and speculators coming in. As North America begins to export LNG to countries and regions who pay such high prices, it can be expected that US prices would naturally rise. We're not saying that prices should rise from $3.75 to $15, but a rise to $7-10 (including the premium required for shipping) is reasonable. Natural gas has entered the strongest 3-month period of the year by far based on historical seasonality (dating back to 1990). All three months (August-October) have shown positive returns most of the time, with September being positive more than 80% of the time! Moreover, the average positive return over these three months is really impressive - 4% in August, more than 14% in September, and nearly 10% in October. 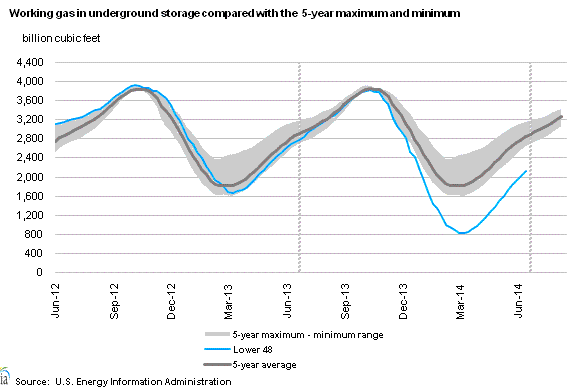 We've had a mild summer, in which natural gas usage was lower. However, any heat waves in August or a cold fall/winter could send prices much higher. With such a significant seasonal pattern in performance, it's a wonder why more people aren't taking advantage of it. 5) Selling at a Discount! After a huge run-up to $6.50 and the significant correction down to $3.75 (40%+ decline), natural gas is offering a very attractive entry point at a steep discount to only a few months ago. If you believe in the long-term bull market in natural gas, or even the short-term seasonality, this is one of the best opportunities to get in at or near a bottom. Even better, natural gas is trading close to a number of very strong support levels which could serve to hold prices up and help natural gas resume its uptrend. Between $3.75, $3.50, $3.00, $2.75, $2.50, and $2.00 -- take your pick. The further it falls, the more I like it; but $3.50-$3.75 could be your last chance before the next move up. 1) Pure Play - If you want to keep it simple and benefit directly from rising natural gas prices, you could invest in natural gas futures or natural gas ETFs. We recommend the most widely-known natural gas ETF as the best option. This ETF is liquid and tracks actual nat gas prices well. 2) Energy ETFs - Investing in energy ETFs could also be a great way to benefit from the broader theme, but the price of Oil (NYSEARCA:USO) will not necessarily move in the same direction as nat gas. However, if you want to maintain diversification and invest in the wider energy space, you could buy the Energy ETF (NYSEARCA:XLE). This will give you exposure to a lot of energy producers like Exxon Mobil (NYSE:XOM), Chevron (NYSE:CVX), Schlumberger (NYSE:SLB), and others. Most of these companies are fairly strong financially and also have decent diversified exposure to nat gas as well. Be careful, however, since the ETF is very heavy on XOM, CVX, and SLB. Also, if oil prices stay below $100 this may not be a great choice. 3) Natural Gas Options - If you truly believe (as we do) that natural gas is a top investment theme, and that the next 3 months-year will see higher nat gas prices, you could leverage your investment via options on the UNG ETF. If UNG is currently trading at ~$21.50, it is not unreasonable for it to rise to $23, $25, or even higher by January or March 2015. If that is the case, buying some upside Call options on UNG would be profitable. 4) Natural Gas vs. Gold (Pair Trade) - I have been a strong believer in this strategy since calling the bottom in natural gas in 2012. Since I think gold (NYSEARCA:GLD) is headed to $700/oz and also think that natural gas is headed much higher from here, going long nat gas and short gold could be a double-winner. If both commodities rise, I expect nat gas to outperform; and if both fall (perhaps due to a deflationary recession) I expect gold to fall further. There are many variations to this trade. 5) Natural Gas Producers - We believe the best opportunity for profiting from rising nat gas prices is to invest in the natural gas companies rather than just natural gas directly. So many of these companies have been overlooked or oversold due to the wide pessimism over nat gas and the bleak outlook for higher nat gas prices. However, with most of the bad news already priced-in, these companies will see HUGE improvements in their financials and earnings as nat gas prices rise. Since most expectations for nat gas prices are only at $4-$4.50 for the next year, a spike above $4.50 or $5 would be such a great catalyst for these companies' stocks. Some nat gas companies have already seen great performance: Cheniere Energy , Linn Energy (LINE), Newfield Exploration (NYSE:NFX), Kodiak Oil & Gas (NYSE:KOG), Devon Energy (NYSE:DVN), and Chesapeake Energy (NYSE:CHK). These may continue to perform well (we like CHK). However, if you want to go for the home run, you should look at the nat gas companies which are trading near their lows and/or have a lot of upside when it comes to improving their financials: Encana (NYSE:ECA), Halcon Resources (NYSE:HK), Quicksilver Resources (NYSE:KWK), Sandridge Energy (NYSE:SD), Forest Oil (NYSE:FST), and EXCO Resources (NYSE:XCO). But keep in mind, these are highly risky, heavily-dependent on nat gas prices, and could even fail to improve even if nat gas prices rise. Regardless, the natural gas space offers huge opportunities and just waiting for the right timing or entry point could result in major profits.